Cornwall, England. 1943-10-14. Members of Spitfire No. 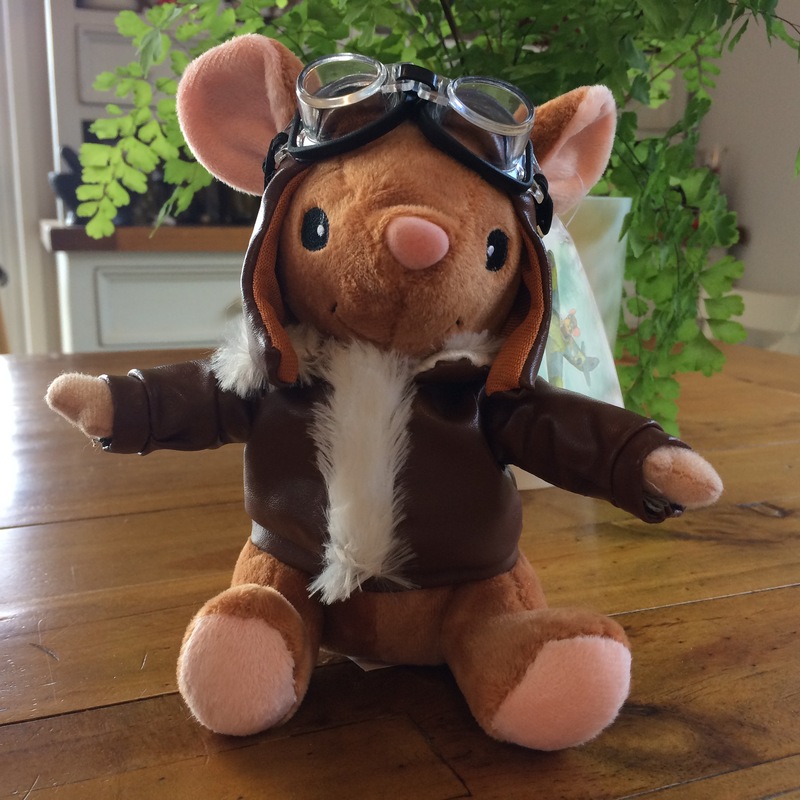 453 Squadron at RAF Station Perranporth, the only Australian Spitfire Squadron, having a last game with the Squadron mascot “Sprog” who had to be left behind when the unit mover to a new location at the RAF Station Skeabrae in the Orkneys. Left to Right: 414519 Flight Sergeant (FLT SGT, later Warrant Officer[WO]) Clarence Alfred Seeney, Gatton, QLD (lost on operations over France on 25 July 1944); 15326 Flying Officer (FO) R. Bush, Sydney, NSW, Engineer Officer; 409147 F SGT K.C. 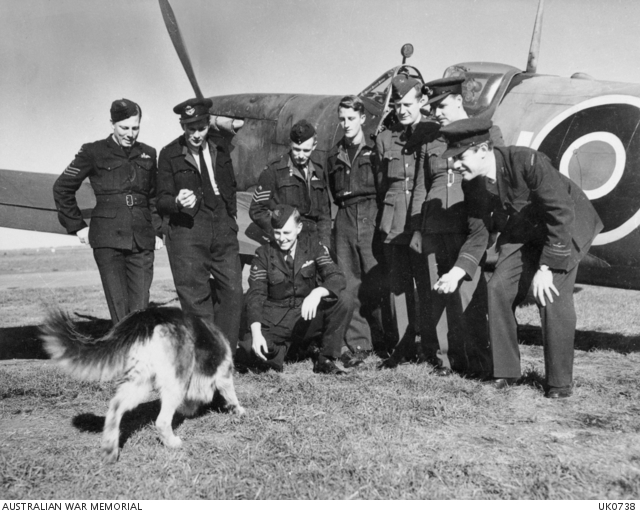 Kinross, Essendon, VIC; 413296 F SGT H.F. Watts, Milton, QLD; 409160 F SGT R. Lyall, Geelong VIC; Warrant Officer “Jock” Young, RAF Radio Officer; FO F.J. Catchpole, RAF Intelligence Officer; 261892 Flight Lieutenant H. Sharp, Sydney NSW, Medical Officer. 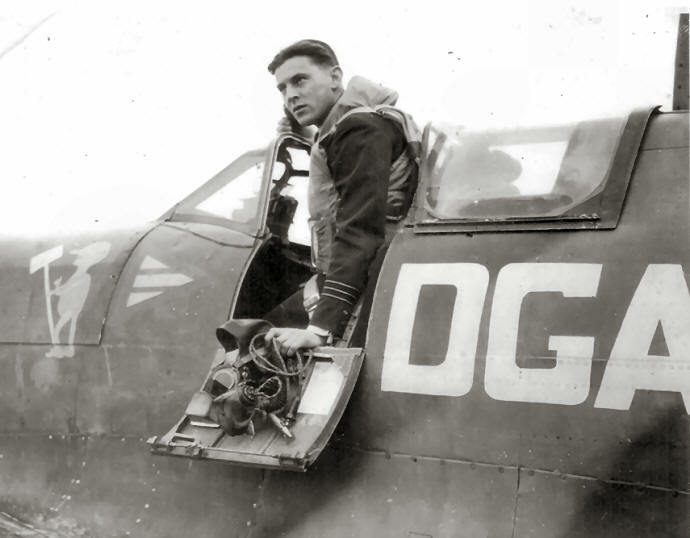 Don – Donald George Andrews (404795) from Southport QLD, came to 453 Squadron as a Flying Officer, was promoted to Squadron Leader and later to Wing Commander and Commanding Officer of 453 Squadron. Don was awarded a Distinguished Flying Cross for fighting off an attack from 6 enemy aircraft and shooting down a Focker Wolfe 190 after being separated from his Squadron. For more information about Don click here. 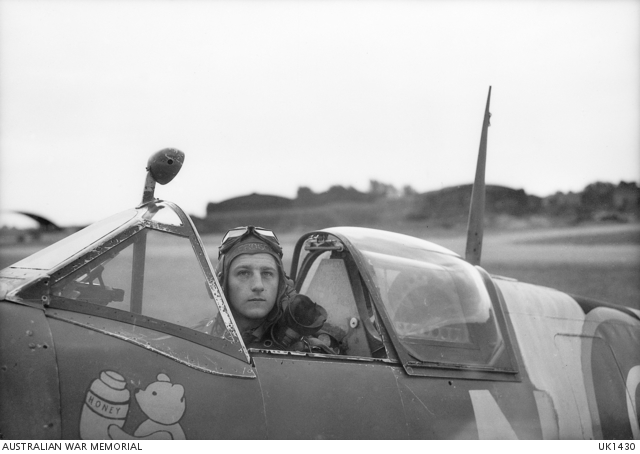 Rod – Flight Sergeant Roderick Lyall (409160) from Geelong VIC. Rod, nicknamed ‘Froggie,’ was hit by flak on 12 July 1944 and crashed south-east of Falaise in France. He spent two days on the run but was eventually caught by four members of the German SS and was imprisoned in various Prisoner of War camps in the region. 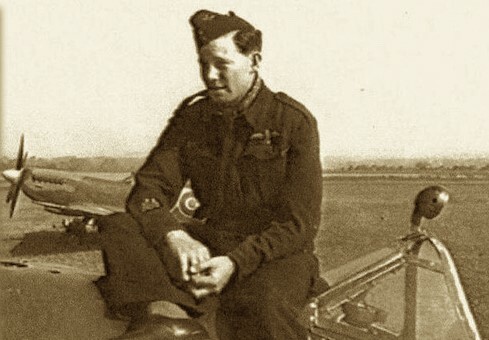 Rod managed to escape, evade recapture and made his way back to 453 Squadron on 18 August 1944. More information about Rod will be posted in January 2018. 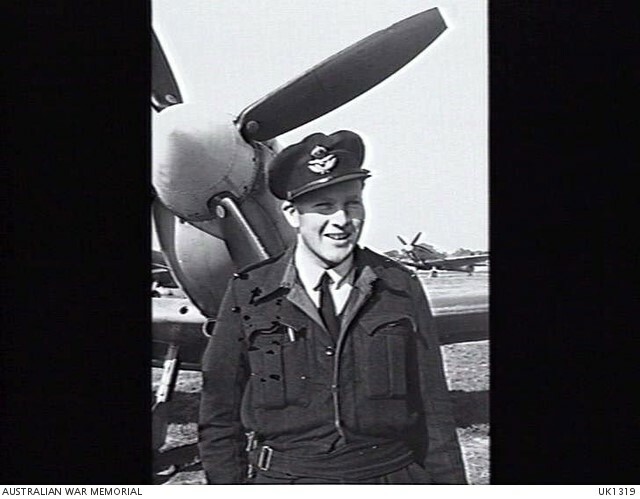 Roger – Flying Officer Roger Bush (415326) from Sydney NSW, was 453 Squadron’s Engineering Officer. 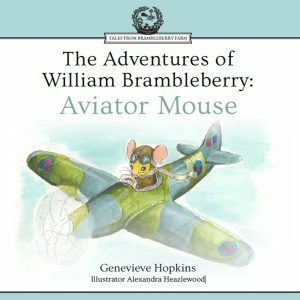 He was responsible for managing maintenance and aircraft availability, as well as leading the Squadron’s Aircraft Technicians. 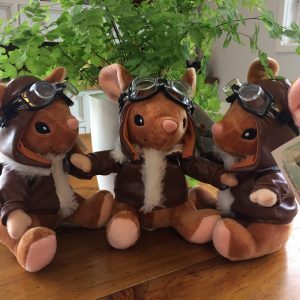 More information about Roger will be posted in January 2018.